It was a rough fourth quarter for many hedge funds, which were naturally unable to overcome the big dip in the broad market, as the S&P 500 fell by about 4.8% during 2018 and average hedge fund losing about 1%. The Russell 2000, composed of smaller companies, performed even worse, trailing the S&P by more than 6 percentage points, as investors fled less-known quantities for safe havens. This was the case with hedge funds, who we heard were pulling money from the market amid the volatility, which included money from small-cap stocks, which they invest in at a higher rate than other investors. This action contributed to the greater decline in these stocks during the tumultuous period. We will study how this market volatility affected their sentiment towards Corindus Vascular Robotics Inc (NYSEMKT:CVRS) during the quarter below. Is Corindus Vascular Robotics Inc (NYSEMKT:CVRS) a buy, sell, or hold? A couple of investors with weak hands were in a pessimistic mood and sold out. The number of long hedge fund positions in CVRS shrunk by 1 in recent months. Our calculations also showed that CVRS isn’t among the 30 most popular stocks among hedge funds. Nevertheless, a large healthcare hedge fund has high hopes for the stock and controls more than 25% of CVRS’ outstanding shares. We’re going to review the recent hedge fund action surrounding Corindus Vascular Robotics Inc (NYSEMKT:CVRS). At Q4’s end, a total of 7 of the hedge funds tracked by Insider Monkey were long this stock, a change of -13% from the second quarter of 2018. Below, you can check out the change in hedge fund sentiment towards CVRS over the last 14 quarters. 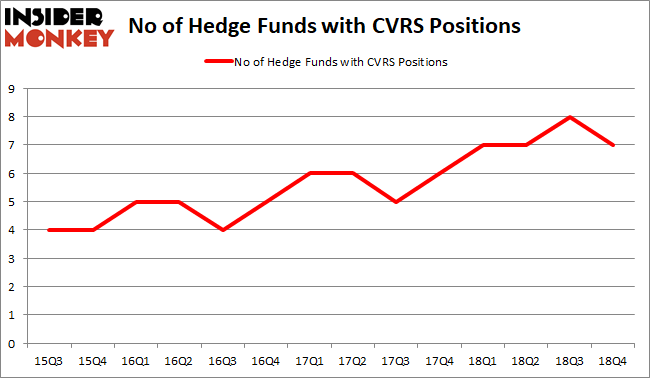 The overall trend is encouraging as the number of hedge funds with CVRS bets increased by 75% over the last 3 years. 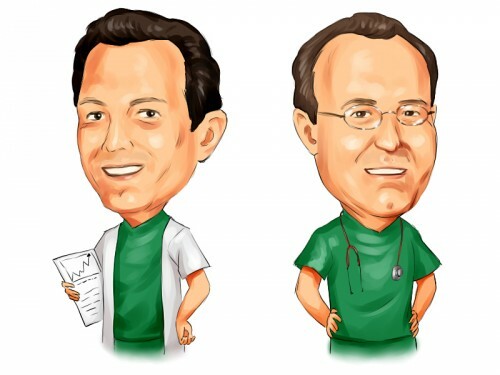 According to Insider Monkey’s hedge fund database, Healthcor Management LP, managed by Arthur B Cohen and Joseph Healey, holds the most valuable position in Corindus Vascular Robotics Inc (NYSEMKT:CVRS). Healthcor Management LP has a $16.5 million position in the stock, comprising 0.5% of its 13F portfolio. The second most bullish fund manager is Douglas Braunstein and James Woolery of Hudson Executive Capital, with a $9.5 million position; the fund has 1% of its 13F portfolio invested in the stock. Remaining peers with similar optimism include Israel Englander’s Millennium Management, Mike Masters’s Masters Capital Management and Michael Platt and William Reeves’s BlueCrest Capital Mgmt..
Due to the fact that Corindus Vascular Robotics Inc (NYSEMKT:CVRS) has experienced declining sentiment from the entirety of the hedge funds we track, logic holds that there was a specific group of funds that slashed their entire stakes by the end of the third quarter. Interestingly, Jeffrey Talpins’s Element Capital Management dropped the biggest stake of the 700 funds watched by Insider Monkey, worth an estimated $0.4 million in stock, and Ben Levine, Andrew Manuel and Stefan Renold’s LMR Partners was right behind this move, as the fund said goodbye to about $0 million worth. These transactions are interesting, as aggregate hedge fund interest was cut by 1 funds by the end of the third quarter. Let’s now review hedge fund activity in other stocks similar to Corindus Vascular Robotics Inc (NYSEMKT:CVRS). We will take a look at Goodrich Petroleum Corporation (NYSE:GDP), Griffin Land & Nurseries, Inc. (NASDAQ:GRIF), Cyren Ltd (NASDAQ:CYRN), and Gencor Industries, Inc. (DE) (NASDAQ:GENC). This group of stocks’ market caps match CVRS’s market cap. As you can see these stocks had an average of 3.5 hedge funds with bullish positions and the average amount invested in these stocks was $20 million. That figure was $36 million in CVRS’s case. Goodrich Petroleum Corporation (NYSE:GDP) is the most popular stock in this table. On the other hand Griffin Land & Nurseries, Inc. (NASDAQ:GRIF) is the least popular one with only 2 bullish hedge fund positions. Compared to these stocks Corindus Vascular Robotics Inc (NYSEMKT:CVRS) is more popular among hedge funds. Healthcore and Hudson Executive Capital were proven right and rewarded handsomely as CVRS shares more than doubled this year. The stock has seen a large insider purchase recently and looks very promising. We urge investors to take a closer look. Was Starboard Value’s Jeffrey Smith Wrong about Newell Brands (NWL)? Are Hedge Funds Right About Berkshire Hathaway Inc. (BRK-B)? Were Hedge Funds Right About Alibaba Group Holding Limited (BABA)? Roger Ibbotson’s Zebra Capital Management’s Return, AUM, and Holdings... ValueAct Capital’s CBRE Recommendation Delivers 150% Gain Were Hedge Funds Right About Alphabet Inc (GOOGL)?